I was amused by the story on the BBC News Web site about how hackers broke into Angry Birds and changed it to Spying Birds. It was also interesting that the Rovio response was that the company did not "collaborate or collude" with any government spy agency. However, I have to wonder whether or not they should have extended that quote by beginning it with "knowingly." What has struck me most about the latest round of news stories following up on the latest round of disclosures from Edward Snowden is the absence of any suggestion that organizations like the NSA and GCHQ were not harvesting any data that were not already being harvested by advertising companies. Indeed, it would not be hard to create a "shadow" advertising company that would be promoting itself on the basis of the power of its data analysis abilities without anyone ever finding out that the company did not have any customers. Could it be that all this fuss is about nothing more than NSA struggling to know just as much as Google already knows? Beyond David Cole's sobering discussion of whistle-blowing, which I discussed this past Tuesday, it occurred to me that there is at least one unexpected consequence of Edward Snowden's actions that has received almost no attention. I would stipulated that his whistle-blowing has made him a primary magnet for right-wing hate speech, which has even penetrated the "comment space" on CNET News. What this may mean is that, as long as Snowden remains a major figure in what the media thinks constitutes news, he will deflect some (probably much) of that hate speech away from Barack Obama. This, in turn, may make it easier for the White House to get its work done with less hassle. I began this month with a post entitled "Recognizing the Need to Blow the Whistle," written in support of the editorial in The New York Times supporting the actions of Edward Snowden. In the latest issue of The New York Review of Books, David Cole has a more extended article entitled "The Three Leakers and What to Do About Them." Perhaps the most important thing about this piece is how skillfully Cole demonstrates how such a simple question cannot be resolved by a simple answer. He begins by trying the establish separate categories of legitimate and illegitimate leaks, from which he then delves into all the complexities involved in trying to tell one from the other. The only parties kept out of the “checks and balances” so often lauded by the NSA’s defenders were the American and global publics—in other words, the people whose privacy was at stake. In other words, while there was a "regulatory chain of command" for reviewing NSA activities, those who most needed to express their offense at having been violated by those activities had no path through which to make their concern heard. Even if the the member of the House of Representatives elected to for their district was sympathetic, his/her hands were tied by the strands of the bureaucratic spider web woven by the wording of NSA regulations. This, it is not only personal privacy that has been undermined and would well have gone unnoticed were it not for Snowden's whistle-blowing, it is that set of "principles of operation" according to which our government works, as it was explained to the first citizens of our country by the authors of the Federalist Papers. Last week I used my Examiner.com national site to run a piece about that plans of the young pianist Sean Chen for the first half of this year. The Steinway & Sons label will be releasing his first recording on March 25; and the "program" that Chen has prepared for this album combines compositions by Alexander Scriabin and Maurice Ravel. This immediately registered with me, since, at the end of last year, I had written a piece about HJ Lim's latest album, which also combined these two composers. To make things more interesting, Chen's Scriabin selections were the fourth and fifth piano sonatas and a short waltz, which, on the basis of reviews I have read of his concert performances, is most likely Scriabin's Opus 38 in A-flat major. These are exactly the Scriabin compositions on Lim's album. The overlaps also include Ravel's "Valses nobles et sentimentales" and a two-hand arrangement of "La Valse." In the latter case, however, Chen is playing his own arrangement. However, he is not playing the sonatine, which was Lim's only other Ravel selection, playing, instead, two minuets, the first based on the spelling of Joseph Haydn's last name and the second called "Menuet antique," along with a prelude Ravel composed in 1914. I have to say, personally, that I find Scriabin and Ravel to be a rather unusual pairing. The summary on the back of Lim's album seems to suggest that both composers will the "logical descendants" of Franz Liszt, particularly with regard to some of his attempts to depart from tonality in his late piano pieces. For my money, those are the words of someone who does not understand Liszt very well and may not understand either Scriabin or Ravel any better. The only explanation I can give is that both pianists were seeking out new material to provide flashy display of virtuoso technique and happened to end with many of the same choices, more likely out of chance than out of rivalry. Since I was not particularly convinced by the Lim album, I shall be curious to see if any promoter directs the Chen album to my attention once it is released. At the beginning of this year, I wrote about an article in the Journal of the American Musicological Society by Rob C. Wegman which suggested that the governing powers of "the city of fifteenth-century Leiden thought more about the issues of both education and poverty than government at any level in our own country in the present day." However, I was not drawn to this article by my interests in educational policy. Rather, I was drawn to the paper by its title "From Maker to Composer: Improvisation and Musical Authorship in the Low Countries, 1450–1500." I had encountered that title while reading Kate van Orden’s book Music, Authorship, and the Book in the First Century of Print, about which I had written (in rather glowing terms) on my Examiner.com national site at the end of last month. The thesis behind this book is that the sixteenth century, which happened to begin with the publication of the first volume of the masses of Josquin des Prez in 1502, was a period during which how people thought about music went through a radical "paradigm" shift (to invoke the terminology of of Thomas S. Kuhn's monograph, "The Structure of Scientific Revolutions." In prior centuries thinking about music was solely a matter of thinking about making it through performance. However, Ottaviano Petrucci's printed volume of Josquin's music introduced the possibility that one could make music by making a document, rather than making a performance. This struck a familiar nerve for me. Last August I had found myself thinking, once again, about the difference between a verb-based approach to thinking about music (where the focus is on those actions that lead to performance) and a noun-based approach in which thinking about artifacts, such as pieces of paper with music notation on them, is more important than the dynamics of interpreting the notation. It was that familiarity that led me to check out what Wegman had to say about the distinction between making and composing. Through this paper, I was pleased to discover that I was far from the first to recognize the distinction between nouns and verbs in thinking about music. Instead, that recognition could be traced all the way back to Aristotle. At the root of Tinctoris's perception lies the Aristotelian distinction between making (poiesis) and doing (praxis). Music, by definition, belongs to the latter category. To ‘make’ is to produce a piece of work, an object, and sound is not an object but motion. It is fleeting, transitory, immaterial: sound cannot be made (factus) but only uttered (prolatus).To think of music as a ‘thing’ is a paradox: things have permanence and spatial extension, and for sound this is unthinkable unless it is represented by ink on paper, thus assuming matter and form. And the principal characteristic of the perception is, in fact, its commonsensical nature, its rootedness in everyday language: a thing is a substance (noun) modified by accidents (adjectives),while motion is caused by action (verb), involving an agent (nominative) and patient (accusative). Tinctoris's written/mental classification, cited above, parallels exactly this noun/verb distinction. While written counterpoint, by its very nature, can only be represented by a noun (res facta or cantus compositus), oral counterpoint necessarily requires one to use a verb (cantare super librum). The noun contrapunctus, covering both, can be an overarching term by virtue of being, not an object, but an ars, a knowledge of the rules for making and doing. Although writing, creating, and making are nowadays used interchangeably as synonyms for composing, medievals were acutely conscious of the distinctions between them, and they carefully maintained these in written statements. ‘To create,’ as Aquinas put it (ibid., 264), is to ‘produce something out of nothing,’ which only the Creator can. To make or to compose is to work on or put together material provided by nature, which is what the artist does. To write, finally, is to copy (scribere). I suppose that, had I been younger, I would have felt disappointed to discover that what I had thought was my own bright idea had actually been hijacked from Aristotle. However, I have been nurturing this idea for quite some time, going back to my own days as a Silicon Valley researcher. No matter how hard I worked at it, I always felt as if I was the only one who saw any value in it. As a result of reading Wegman's paper, I no longer feel quite so solitary! When I last worked in the [French] Archives Nationales, scribbling notes on index cards—difficult to find these days—and trying to shut out the tap-tap of computer all around me, I felt hopelessly antiquated. At one point I came upon a document so rich and lengthy that I asked the archivist on duty whether I could have it photocopied. She replied with a smile that the copying machines had gone the way of typewriters. I should buy a digital camera. This did not totally surprise me. There is a wonderful archival collection on the top floor of the Main Branch of the San Francisco Public Library, a great place to read reviews of concerts given in San Francisco 100 years ago. During my first visit, around the time I began writing this blog, I encountered table after table sporting tripods for cell phones with cameras built into them and researchers scrupulously setting up their shots. My guess is that those photographic pages of text would download their images into their OCR system of choice. It never occurred to me to ask if there was a copy machine near that room, coin-operated or otherwise! Yesterday's Taliban attack in Kabul, Afghanistan, was, without a doubt, a major news story, significant enough that it is still reverberating. Having now gone through several reports, I still find that the Al Jazeera English article, which takes wire service material and adds their own "local knowledge" sources, makes for one of the best accounts. Perhaps one of the reasons that my attention was drawn to their treatment was that it reminded me of Edgar Allan Poe's "The Masque of the Red Death" and the futility of that tale's protagonist to insulate himself and his closest friends from the ravages of a plague. It has steel doors and customers have to pass through security to get in, as is the case with many restaurants in the city. There was a suicide attack on a foreign hotel where special foreign invaders are coming for dinner. We may choose to debate whether or not that noun "invaders" is appropriate; but no such debate is necessary in the eyes of the Taliban. This is yet another case in which it would be folly to deny that the attacker has a point of view. The use of that noun clearly indicates a point of view that foreigners are exploiting Afghan resources with the collusion of other Afghans getting rich in the process. This is an effort to fight back against the invasion and driver out the invaders. The only problem is that history tells us what happened the last time the Taliban succeeded in this mission. All this took place just as Prince Prospero's most favored guests were preparing for the relocation of his fortified castle to Davos. My guess is that the Taliban will be given a generous amount of lip service. It is unlikely, however, that they will receive any other kind of attention from the World Economic Forum. This would make the Taliban the reductio ad absurdum of the activism of the impoverished. Someone should start wondering whether or not such bloodthirsty absurdity is really the only way to deal with the unabated growth of poverty around the world. This morning Al Jazeera America ran an excellent story about how the War on Poverty that Lyndon Johnson declared during his Presidency has still not been resolved. The presentation was impressive in that there was absolutely no finger-pointing, just a straightforward account of the ongoing plight of those who, for one reason or another, have fallen through the cracks. I also have to wonder whether or not there was a bit of context sensitivity on the part of the show-runner for segment I saw. At the conclusion of the report, there was a brief coming-up-next clip, the subject of which was the current Consumer Electronics Show. The contrast was unavoidable as we saw this overblown trade show, which basically appeals to those who have become affluent through new technologies. The subtext is that, having found a comfortable life style, all that matters is maintaining that comfort through even newer technologies for toys, games, and any other devices that will block out the realities of everyone else in the world living with economic disadvantages. Today the Web site for The New York Times ran an obituary by Bruce Weber for Anna E. Crouse. I knew about her only as the widow the of playwright Russel Crouse and, on a more personal level, the mother of the actress Lindsay Crouse. That "personal level" came from my having written one of my first "serious" dance reviews about the piece that Lindsay had created for her Senior Thesis at Radcliffe. What I did not know until I read Weber's piece was that Anna Crouse had be instrumental in creating the TKTS booth in Duffy Square, a major institution for those of us who could only enjoy New York theater on the cheap. Weber also observed that she "was a central figure in the resuscitation of Lincoln Center Theater," which, on the basis of some of the productions I saw after that "resuscitation" definitely makes her worth remembering. Anna Crouse was clearly someone who believed that the performing arts should be for everyone; and, with everyone so locked in to market-based thinking, I have to wonder whether anyone with her mindset remains to carry on her visions. 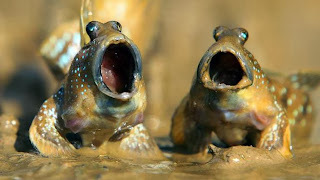 As far as I am concerned, the only way to look at this photograph of a pair of mudskippers is while listening to your favorite recording of "O soave fanciulla!" Watching the news over the last few days, I am beginning to feel as if I am in one of the few parts of the country where the temperature is tolerable. If I expand to the global scale, I also realize that we are also not in jeopardy of severe flooding due to either storms or tidal activity. Fortunately, it doesn't take much for me to remember that we are, instead, facing the prospect of extreme drought conditions. Between our fatuous efforts to try to control everything and our self-indulgent pigheadedness when it comes to recognizing environmental problems, Mother Nature still seems to hang in there and make sure there is enough misery to be distributed to too! For those who have not encountered the details behind this story, the newspaper that ran this editorial was The New York Times. I wanted to cite this example because yesterday afternoon KGO-TV attributed exactly the same motives behind the hacking of Snapchat. In this case, however, the source they cited was anonymous (lower-case). When the Snapchat story first broke, KGO was there interviewing members of the Silicon Valley technology community, basically making the case that Snapchat management had been informed of security flaws and had been negligent in addressing them. Anyone who has had to live with the "Patch Tuesday" culture of Microsoft knows that both the reliability and security of software are moving targets. These are not "goals" that one reaches through some sort of hill-climbing technique. They are problems that arise in software not only because of the code but also because of the environment in which the code is embedded, an environment that involves factors that programmers may not know about or cannot control even when they are aware of them. One cannot attribute these flaws to malice; but, if they are not recognized and repaired, they can be used maliciously. 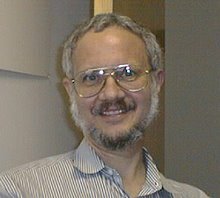 The Snowden case provided us with a situation where, because of the "cult of secrecy," recognition itself was problematic, thus leading to exploitation rather than repair. In the case of Snapchat, the consequences have not been as embarrassing as they were for projects like Prism; but those who were embarrassed would probably feel otherwise. Many of last month's retrospective articles talked about 2013 as "the year when trust died" (or words to that effect). I found those article naïve, to say the least. Swindles are always perpetrated in the name of trust (or, if you prefer, confidence). They were probably with us before history began to be documented, and they were probably remain with us. They succeed under the assumption that suspicion requires too much time and effort, meaning that you might miss out of all the fun. Nevertheless, there will always be individuals determined to prevent the hapless from being victimized; and sometimes that act of prevention requires blowing a very loud whistle. Notwithstanding the extent to which the "creation of wealth" through expanded consumerism has led to a pandemic undermining of our entire educational system (presumably because educated customers are more selective about what they buy and are less likely to give in to impulses), I came across an interesting bit data point that allows us to compare the current state of music education with the way things were 560 years ago. I have been reading a paper that Rob C. Wegman published in the Journal of the American Musicological Society that focuses on musical activity in the Low Countries between 1450 and 1500. One of his sources of data involves the hiring of one Jacob Tick at a choirmaster by the magistrates of Leiden on October 16, 1454. It would thus appear that the municipal officials viewed counterpoint as a valuable skill for both liturgical and generally secular purposes. As such, the art was not reserved exclusively for children of the well-to-do. An additional clause in Tick's contract covered the eventuality of parents being too poor to pay for lessons in discant. Poverty, it was evidently felt, should not pose an impediment to musical training, even if children were taught for their own rather than the church's benefit. Apparently, the city of fifteenth-century Leiden thought more about the issues of both education and poverty than government at any level in our own country in the present day.